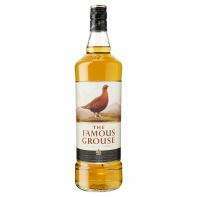 A whole 1000cl of Famous Grouse for just £15. In store and online. Useful to have in stock for once your palate stops responding to pricier varieties. Also good when you're in the mood for quantity over quality. Currently on offer at £16 in Tesco which is also good. same price for Smirnoff vodka and Gordons gin!! This was £16 at Tesco last week, maybe still, which was such a good price that I bought two. DOH! HEATED. I've had the worst hangovers ever from drinking this stuff ... so I don't drink it anymore! I'll just stick to my Vodka! these were £17 last week in asda,reckon theyve dropped to match morrisons?